As trends in technology continue to show that smaller is better, the need for compact components shows no signs of dying down. Flexible wire, in particular, is essential to the functioning of many small devices. Aside from its size, what sets it apart from other types of hook-up wire is its resistance to constant flexing. This allows it to fit easily into small spaces. 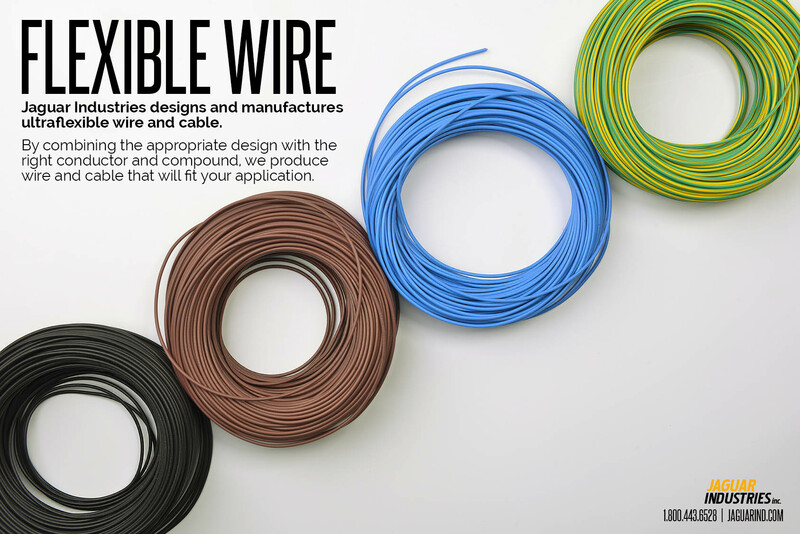 Flexible miniature wire comes in a variety of materials. The type of conductor and insulation influences not just how much bending the wire can take, but also how it performs. At Jaguar Industries, we’ve developed our own brand of flexible wires to meet the needs of robotic and servo applications. The JAG-Flex™ line of hook-up wires features PVC insulation and stranded soft copper conductors to provide flexibility while maintaining a high level of durability. Available in two variants, the Jag-XFLEX™ Extra Flexible and the Jag-SUPERFLEX™ Super Flexible wire, our special brand of miniature wires conforms to a number of specifications. These specifications include UL-VW1 (Style 1692, 1624, 1568, and others), MIL-W-16878/1 (Type B) Except Stranding, and MIL-W–76 (Type LW) Except Stranding. These wires are also available in a wide range of miniature AWG sizes from 16 to 26 for the Jag-XFLEX™ and 16 to 36 for the Jag-SUPERFLEX™. While we do have our special brand of wires to offer, we also take pride in our custom manufacturing capabilities. If there is a specific kind of miniature wire you need, we can make it. Simply contact us to get started. You can also request for a catalog to view the complete range of wire and cable products we have in stock. Whether you choose to purchase our special brand of flexible wires or have something custom manufactured, we offer a number of value-added services to ensure that everything is done according to your specifications. To customize the look of your wires, we can have them dyed, striped, and marked for easy identification or branding. We can also ready the wires for use through our cutting, stripping, terminating, and crimping services. To ensure that your order complies with your technical requirements, we run the wires through laboratory physical and electrical tests. By doing so, you can be certain that whatever product you order from us will surely meet your business’ needs. Have any other questions regarding our flexible wire and the services we provide? Feel free to contact us through our toll-free number: (800) 443-6528.